Banish Stretch Marks With RevitaGen. Stretch marks affect numerous women and can truly lower their self-esteem. Many a woman has had to cover up at the beach or pool to hide the embarrassment of her stretch marks Fortunately, you can make your stretch marks disappear. If you're tormented by the shame of stretch marks, then RevitaGen is just what you've been searching for. Stretch marks are imperfections deep in your skin which are the result of fissures in your collagen and insufficient hydrating of your elastin fibers. RevitaGen assists your body to repair these imperfections, creating smoother, younger-looking skin. RevitaGen doesn't simply conceal stretch marks like other stretch mark creams; it truly makes your stretch marks vanish. Use RevitaGen twice daily: one when you first wake up and again right before bed. Wash and dry your skin prior to use. Using your fingers, apply a small amount of RevitaGen to the affected areas. Use RevitaGen sparingly, as the formula is extremely concentrated. Use a circular motion to lightly massage RevitaGen into your skin until it has been completely absorbed. You might encounter some slight tingling or a warm sensation after application -- this means that RevitaGen is working. Palmitoyl Pentapeptide-3 is a patented molecule which stimulates both hyaluronic acid production and collagen synthesis. This allows you to rejuvenate damaged skin subcutaneously. Palmitoyl Oligopeptide is another powerful peptide which promotes collagen synthesis within the skin. Palmitoyl Oligopeptide is also recognized for its effectiveness in deep hydration and skin rejuvenation. Palmitoyl Tetrapeptide is a powerful peptide which suppresses the creation of interleukins, the chemical compounds which trigger an inflammatory response. Retinyl Palmitate is a variety of Vitamin A which revitalizes skin cells without causing any irritation. This plant extract has been employed to cure wounds and burns for generations. Siegesbeckia Orientalis is traditionally used to diminish the look of scars and stretch marks (which are a type of scar), stimulate wound healing, and relieve inflammation. Phyllanthus Emblica is a powerful plant extract that encourages collagen synthesis, functions as a potent antioxidant, lightens skin discoloration, and shields your skin from UV damage. 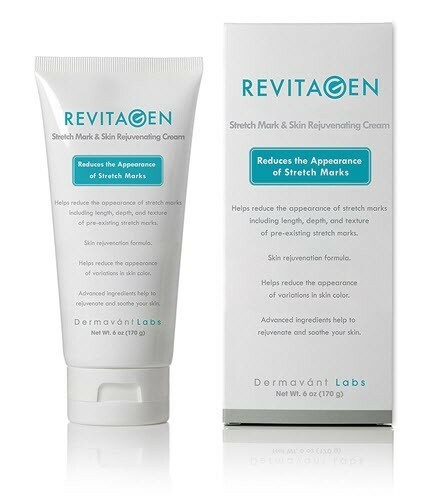 RevitaGen repairs stretch mark damage to make them disappear. RevitaGen utilizes potent ingredients, among them three patented peptides, to stimulate collagen production and renew damaged skin. Decrease the look of ugly stretch marks and enhance the health of your skin with RevitaGen.